First Class Care For Your Pets in Luxury Accommodation! Highbridge Kennels & Cattery provides luxury heated accommodation in a purpose built kennel and cattery, set in a beautiful rural location just 8 miles from Fort William. As this is a small family run establishment pets are assured of care and personal attention from the owners who are trained and experienced in the care of animals. 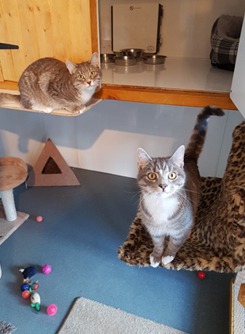 We accept dogs and cats for short stays and the quality of accommodation and high level of care makes it a particularly desirable location for longer stays. Day boarding is also available on request. Vaccination cards must be brought with you otherwise we will under no circumstances accept any cats/dogs into the property. Welcome to ‘Highbridge Kennels & Cattery’, we are a family run business and we are based in Highbridge Inverness-Shire. We provide a luxury heated accommodation in a purpose built kennel and cattery, set in a beautiful rural location just 8 miles from Fort William.